Insecticidal soap can be used for killing various insects on contact. Remember it may kill all insects so do not spray when bees are around or where you may hit other desirable insects. 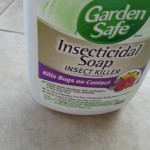 Insecticidal soap is said to not harm most beneficial insects but I would avoid spraying them just in case. I use insecticidal soap mostly for aphids. Before I spray I check for small black and red crocodile creatures. These are the larvae of lady bugs. If I see them or the adult lady bugs I will not spray at all or be very careful to spray parts of the plant where I do not see them. Insecticidal soap can also be used indoors on houseplants. It may help control aphids, mealy bugs (look like small bits of cotton on your plants), white flies, and spider mites. If you have tiny black gnats flying around you have fungus gnats which are due to over watering. Cut back on watering to kill them off. Be sure to spray under leaves and on branches and twigs. If I have a pest problem I will spray the entire plant unless I have lady bugs or their larvae as mentioned above. Do not use insecticidal soap (or any pesticide) when temperatures are above 85 F or in full sun. You may want to rinse plants off with water within a few hours of spraying insecticidal soap to avoid any chance of plant sensitivity and to remove any insect residue. If you have not used it before test insecticidal soap on a small portion of the plant to see how it does. Insecticidal soap can be used on the day of harvest which makes it a great option for use on vegetables. 1 T. liquid soap – Dr Bronners Pure Castile or cheap dish soap (not dishwasher detergent). I would avoid any soap with degreasers to avoid harm to plants. Fill spray bottle with one quart of water. Add 1 T of soap. Attach sprayer, shake or swirl to mix. Spray plants. Be sure to always label spray bottles with what it contains. You might even want to write the recipe right onto the bottle. You may also add 1 1/2 t cooking oil to the solution which may improve its effectiveness. A pinch or garlic and/or red pepper added to the mix may help repel insects. If you do not want to make your own several brands sell pre made insecticidal soap. Want to learn more about organic gardening techniques? Join this website or attend one of my classes or contact me for a one-on-one garden consultation or coaching session.